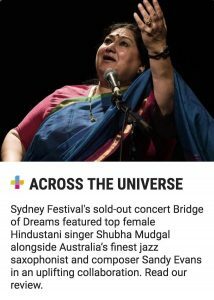 BRIDGE OF DREAMS, City Recital Hall in association with SIMA and Sydney Festival, 12 January 2019. The one-night-only, world premiere at City Recital Hall of Bridge of Dreams has to be among the best and more memorable events of this January 2019 in Sydney. For me, dramatically, musically and creatively it was the most exciting and rewarding evening in a long time. For a couple of hours, the sold-out house was enraptured by an astonishing collaboration between creator-composer-saxophonist Sandy Evans, the Indian virtuosi singer-composer-lyricist Shubha Mudgal, her husband, tabla-player-composer Aneesh Pradhan and harmonium player Sudhir Nayak; Sydney’s own Sirens Big Band led by Jessica Dunn and pianist-composer Zela Margossian. Bridge of Dreams began, one brick at a time, some years ago through Evans and her friend Melbourne’s Bobby Singh (tabla) riffing on the idea of a bridge between Australian jazz and Indian music. Bit by bit it brought together, virtually and in person, the key personnel and slowly their various approaches and emerged the basis of what is now available on Rufus Records and in all formats, if you missed the concert. Bridge of Dreams is wonderfully unusual in that there is none of the awkwardness so often found in attempted “East-West” fusion works. Rather, there is a soaring meeting of minds and sounds in, for instance, the ostinato facility of the harmonium, on one side of the stage, melding with the brass and saxophones on the other. In Tabla Spiral, Zela Margossian begins with a meditative piano solo into which Bobby Singh and Aneesh Pradhan add a conversation of the sounds and rhythms of the tabla. They bring their instruments into the mix to repeat the dialogue before the trumpets, trombones and saxes of Sirens Big Band join them in a thrilling, mesmerising exploration of similarity and difference. 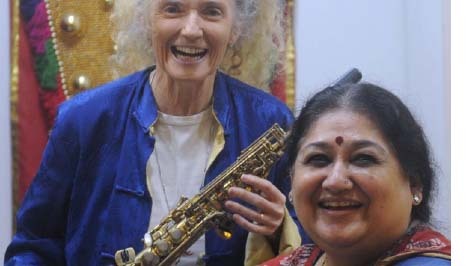 Similarly, there are passages of exquisite balance and melody when Shubha Mudgal’s richly sonorous voice duets with Sandy Evans’ lilting soprano saxophone in written and improvised pieces based in the poetry and traditions of north India. The nine pieces that make upBridge of Dreams range across history – of ancient India and early jazz, through Western improvisation, Indian poetry and song and contemporary composition. With the idea semi-fledged, Evans used a Churchill Fellowship to go to Mumbai and spend time with the musicians. From then and over a period of two to three years, Skype, MP3s and other technology – musical and computer – became integral to the growing partnership, as did such diverse inspirations as Louis Armstrong, the 1430 Chagzam iron chain bridge and mystic poet Kabir. Dunn’s magnificently flexible double bass underpins the entire work as well as highlighting the melodious qualities of tabla and the possibilities for synchronous partnering with the western drum kit and percussion (Ali Foster and Claudine Field). On the night, at City Recital Hall, the 23-piece ensemble – and audience – were very well served by sound engineer Ross Ahern, with the uncommon range of voice and instruments reaching every part of the auditorium with clarity and precision. All in all, Bridge of Dreams is the kind of human alliance, musics and outcome that audiences and (most) Festival directors fantasise about. That the work is already publicly available as a recording is a miracle (at $24.99 on disc and $18.99 download from Bandcamp). Yet it doesn’t quite cancel out the thought that, at another time and budget, the ABC would have been in the house recording it for live and subsequent broadcasting. Let’s hope the ensemble will be gathered together again on a stage before long – Adelaide? Mumbai? Edinburgh? We can dream.